Healthy Teeth for aHealthy Life! For the past 33 years, Dr. John McDonald has provided patients and families around San Antonio with quality dental care, including beautiful restorative and cosmetic procedures. We will address our patient's dental needs with courtesy, gratitude and compassion, striving to deliver quality comprehensive dental care in an environment that is comfortable to both our patient and our staff. Your Healthy Smile Starts Here! You can take advantage of comprehensive dental treatments including regular cleanings, fillings, crowns, and veneers to improve or maintain your level of oral health. Dental implants are one of the most advanced forms of dental treatment available, and if you’re missing teeth, dental implants mean the rejuvenation of your smile, bite function, and confidence. Missing teeth, aside from changing your facial structure and appearance, may have adverse effects on your self-confidence. Implant dentistry can give you back your smile! If you’ve been experiencing facial and neck pain as well as recurring headaches, you may be suffering from TMJ/TMD. Dr. McDonald can identify if you have TMJ/TMD and create an effective treatment plan for your specific needs. We offer both oral conscious sedation and inhalation sedation. Sedation dentistry provides safe, comfortable dental treatment for patients with special needs and is a method of managing pain and anxiety during dental care. We are one of the few practices that take the time to cater to our clients by providing excellent, on-time service and showing you that we really do care. Our staff makes every patient feel as if they are family. Ask your friends and neighbors about us! After being a part of this community for well over three decades, we’re sure you’ll hear wonderful things from our patients! Contact our office Monday through Thursday to schedule an appointment. We hope you’ll become a part of our family of patients soon! 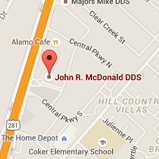 Serving San Antonio, New Braunfels, and Bulverde, TX - Dr. John R. McDonald is your cosmetic, restorative and general dentist, offering dental care for children, teens, and adults.